Now available in a convenient and economical bundle to help you save on the products you love. 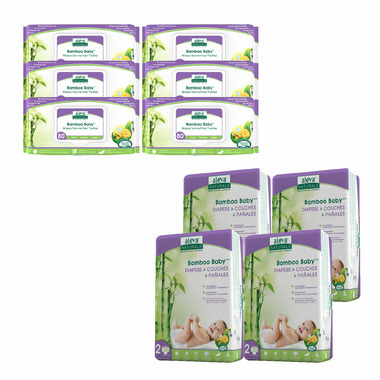 This bundle contains Aleva Naturals award-winning Bamboo Baby® Diapers and Bamboo Baby Wipes to conquer diaper changes both big and small! Bamboo Baby Diapers are the perfect eco-friendly alternative for green conscious parents. They are made with unbleached bamboo fibers on both top and bottom layers to provide the best comfort and protection on the most sensitive skin. Traditional diapers are bleached with harsh chemicals, and the residue from these bleaching agents may be one of the many causes of skin irritations and rashes. Bamboo has an anti-bacterial agent called Bamboo-Kun, and therefore does not require bleaching. For this reason, Bamboo Baby Diapers will give moms the peace of mind that they are providing the best for their baby’s precious skin. Bamboo Baby Diapers are ultra-soft with a cloth-like feel to provide the maximum comfort for your baby. These disposable diapers are extra-strong with flexible side panels, a breathable back layer and a pocketed back waistband to ensure a snug and comfy fit for your baby. For extra leakage protection, our double sided leak guards are snug around the legs, while the 3 line wetness indicator changes colour to alert parents it is time to change their baby’s diaper. Aleva Naturals® Bamboo Baby™ Diapers are the comfortable, reliable and eco-friendly choice! Baby Wipes are essential for your newborn child. You want to make sure that you take care of your baby’s sensitive skin and minimize as many irritations as possible. Aleva Naturals unique Bamboo Baby Wipes are different from any other! They are unbleached, ultra-soft and extra-strong, for the gentlest and safest touch on your baby’s precious skin. The combination of Organic Aloe Vera, Chamomile, Natural Tea Tree and Lavender Oils gently soothe, cleanse and leave your baby’s skin feeling silky smooth. ULTRA-SOFT & EXTRA-ABSORBENT: These diapers are super soft on baby’s delicate skin and extra absorbent for maximum protection. MADE FROM ECO-FRIENDLY, BIODEGRADABLE & UNBLEACHED BAMBOO FIBRES: Made with eco-friendly, biodegradable and unbleached bamboo fibres on both top and bottom layer for a feeling that is soft to touch and soft on baby’s bottom. CHLORINE FREE & LATEX FREE: These diapers are a natural bamboo colour as they do not require bleaching or other chemical treatments. EXTRA-STRONG FLEXIBLE SIDE PANELS: We believe a diaper is only as good as its functionality. That’s why we designed them carefully to include all the features for a comfortable, snug and leak-proof diapering experience. Flexible side panels fit snugly around baby’s upper thighs to avoid diaper blowouts and leaks! STRETCHABLE BACK WAISTBAND: As baby’s grow and transition between sizes, parents are often caught “in-between” with diaper sizes. These diapers feature a stretchable back layer and double sided leak guards to ensure a snug fit no matter if baby is on the lower end or higher end of the recommended weight class for the particular diaper size! 3-LINE WETNESS INDICATOR: The 3-line wetness indicator will turn a dark green colour to alert parents as to when it’s time for a change! 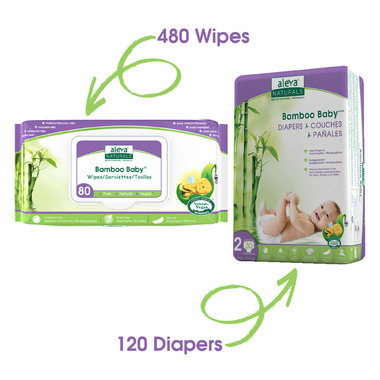 ULTRA-SOFT & EXTRA-STRONG BAMBOO WIPES: Most wipes are made from polystyrene or other fabric blends and they differ by what ingredients are mixed into them. Aleva Naturals® Wipes are made with 100% rayon from bamboo which is cross-guarded to be ultra-soft and extra strong. The rayon from bamboo fibers are naturally anti-bacterial and DO NOT require any bleaching! BIODEGRADABLE IN 21 DAYS! : Committed to sustainability, bamboo is one of the world’s fastest renewable natural resources! 100% PLANT-BASED NATURAL & CERTIFIED VEGAN: Specially formulated for baby’s sensitive and delicate diaper area, these wipes are enriched with organic aloe vera, chamomile, natural tea tree oil and lavender essential oils to gently cleanse, soothe and leave your baby’s skin feeling soft and silky smooth. Water alone dries out skin and doesn’t effectively clean the diaper area. The unique blend or natural and organic ingredients was formulated by a pharmacist, herbalist and naturopath, each bringing his or her unique perspective to deliver a product that provides therapeutic results and is perfect for all skin types. SUITABLE for diaper area, hands & faces too! Bundle Includes: Size 2 - 4 x 30ct diapers and 6 x 80ct wipes.